You take a step, then another. With your third step the lactate burn feels like a knife in your thighs. You pause for a minute, breath deeply in the thin, cold air. Then take another three steps and pause. Anyone who has climbed at altitude knows the shuffle that makes you feel like you’ve aged 50 years in the space of a few days. Climbing (or hiking) at altitude is not just difficult. It can be downright dangerous given the risks of altitude sickness. On my expedition to Mt Mera one of the local Nepali porters suddenly started staggering and looking confused at about 5,800m high. These were the first signs of High Altitude Cerebral Oedema (known as HACE), which can kill in hours. We took his pack and turned him round, sending him back down almost 1000 meters as fast as he could run to a treatment centre. He was fine, but had he carried on he might have died. Treat altitude with respect, it can be a killer. The usual tips when acclimatising for altitude are to ascend no more than 300m (1000 feet) between camps each day. You can climb higher during the day, but should not sleep at intervals of greater than that. You should also give yourself an extra day to acclimatise every 1000 m or so. The truth is that the more time you give yourself to acclimatise, and the more time you spend climbing high and then sleeping low, the better you will be able to manage altitude. For instance on Mera we spent a night at the base camp (4,900m) then hiked up about another 1000m to the top of the glacier, then went back down again for a night’s rest and a day’s rest. Then after that we headed up the glacier to the high camp and spent the night there (5,800m) before heading for the summit. I was quite pleased in that of the group of 13 people that I lead, all 13 of us got to high camp safely and spent the night there (although 2 people then decided not to summit). 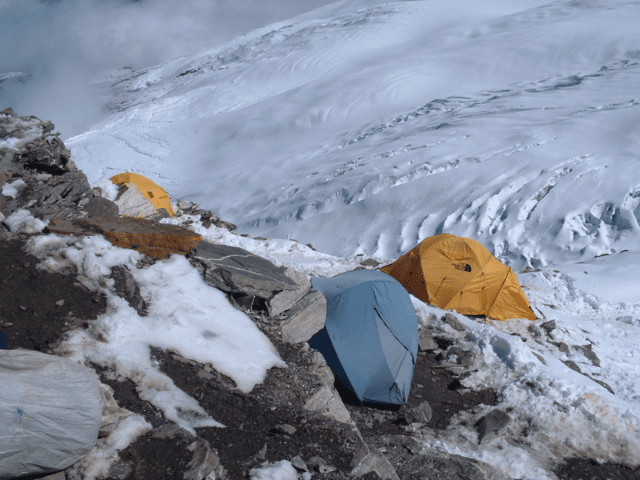 Apart from one of the porters who turned back, none of the climbing party suffered altitude sickness. This is a long digression before raising the point that if you don’t have time to acclimatise fully on the mountain, what about doing it at home before you leave. At the recent Telegraph Outdoor Show in London I came across a really interesting company called AcclimatiseMe with the technology to let you acclimatise at home. The logic is simple enough. They provide a system that lets you breath air in which the oxygen level has been depleted. This forces your body to start the adaption process of getting more red blood cells, increasing respiration rate etc that you would normally do on the mountain. They reckon that about 30 minutes a day on the machine is enough to trick your body into adapting, even though the rest of the time you may be at sea-level. There is some mixed science on whether this works including this research paper, but the logic seems pretty sound. If it works it especially makes sense for mountains such as Kilimanjaro where you race up and down in a very short space of time and the biggest issue is that you don’t have time to acclimatise.